You are currently browsing the tag archive for the ‘Menu Creation’ tag. To get going with this tutorial one needs to go through all the previous 3 parts because we are using the same code from the previous tutorials and taking it a few steps further. Our main emphasis in this tutorial will be on adding a Menu to our Android GoogleMaps project and perform different actions using the buttons of that menu. So wat we will do is to create a menu with 3 buttons. Just like the one shown in the image below. Before we start we will copy 3 images(mylocation.png,satelliteview.png,normalview.png) in the drawables folder in the res folder. After this we will create a new xml file in the layout folder. We will name our file as “menu.xml”. The code for menu.xml is given below. Save the menu.xml file and open GooglemapsActivity.java file. 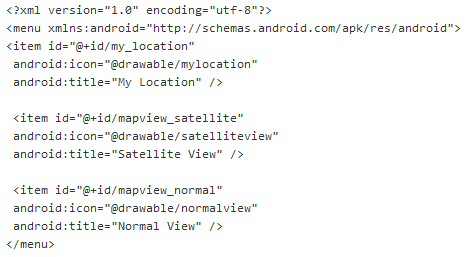 Now add the following code after the onCreate method in the GooglemapsActivity Class. In the above code, i have used locLstnr.gpsCurrentLocation(). To follow this completely one has to go through all the 3 previous parts of this tutorial. I have created a user defined function by the name of gpsCurrentLocation inside MyLocationListener Class. In this function I am getting the current coordinates and animating the map to that location. In the above code I have used the menu button to initiate this function. Now when we click the “My Location” button, the map will be animated to the current location, if we click the “Satellite View” button the map will be converted to satellite view and if we click the “Normal View” button than the map will be converted to Normal View. Run and test the project and it will give us the following out put. Normal View Button Clicked and if the map is not is normal view it will be converted to normal view. Now coming to the zooming functionality. All we need is just one line of code in the GooglemapsActivity Class. Add the following line after mapView = (MapView) findViewById(R.id.mapview1); in the onCreate method of our main GooglemapsActivity Class. Run the project and click on the map, click is must. As soon as the map is clicked the zooming controls will appear on the map. ur confusion is right coz i have slightly changed the logic in the MyLocationListener Class and have not posted the Updated code.. 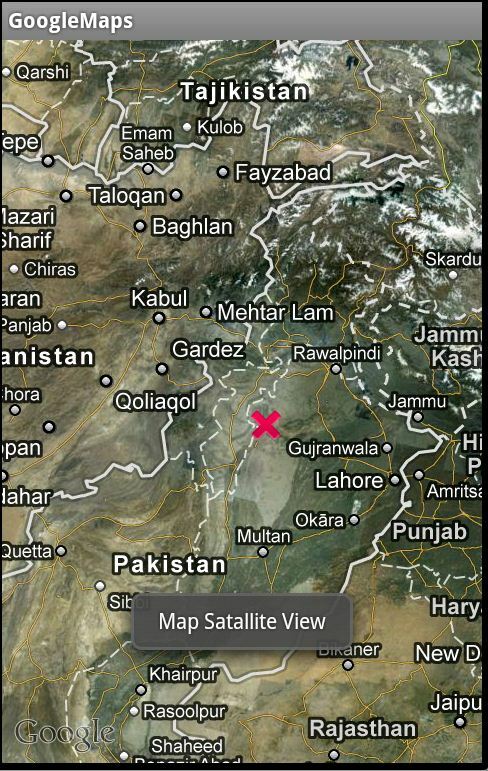 The target was to click a button and move to the current location of the GPS. But it was not that simple. So here is wat i did. In the onLocationChanged() method in MyLocationListener Class i assigned the Latitude and Longitude to two hidden textviews. Than i created a new method inside MyLocationListener Class i.e, gpsCurrentLocation(). In gpsCurrentLocation() method i have used the code to get the coordinates from the textviews and animate the map to that location. Now come to the code of ur button click, or in my case menu click. Create an object of MyLocationListener Class. and simply call the the gpsCurrentLocation() method through that object. 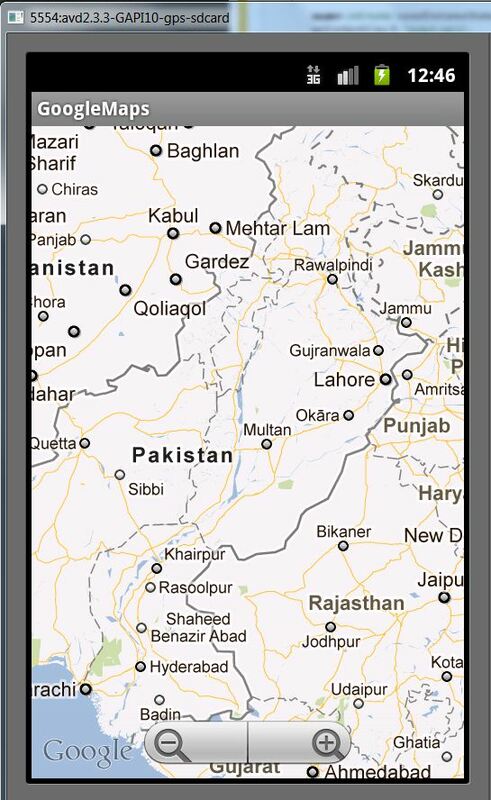 and u will be able to animate the map to the current GPS coordinates. Plz leave ur comments if this solves the issue of animating the map to the current GPS coordinates on button click or menu click. Update # 2: In response to Sagar Zade issue.